By the Lifeboat Foundation Scientific Advisory Board including Stephen M. Maurer. This is an ongoing program so you may submit suggestions to [email protected]. Emergency hospital during 1918 flu epidemic, Camp Funston, Kansas. The 1918 flu may have killed as many as 25 million in its first 25 weeks; in contrast, AIDS killed 25 million in its first 25 years. 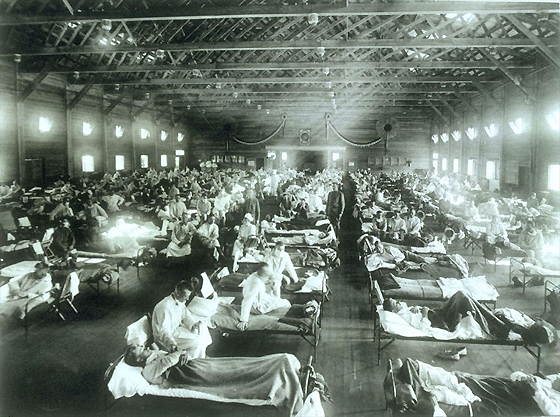 The 1918 flu killed more people than the Great War, known today as World War I (WWI). It has been cited as the most devastating epidemic in recorded world history. More people died of influenza in a single year than in the four years of the Black Death Bubonic Plague from 1347 to 1351. The U.S. government has decided to post the recipe for its eight gene segments here. Today more than a quarter of all deaths worldwide  15 million each year  are due to infectious diseases. These include 4 million from respiratory infections, 3 million from HIV/AIDS, and 2 million from waterborne diseases such as cholera. This is a continuing and intolerable holocaust that, while sparing no class, strikes hardest at the weak, the impoverished, and the young. The new realities of terrorism and suicide bombers pull us one step further. How would we react to the devastation caused by a virus or bacterium or other pathogen unleashed not by the forces of nature, but intentionally by man? No intelligence agency, no matter how astute, and no military, no matter how powerful and dedicated, can assure that a small terrorist group using readily available equipment in a small and apparently innocuous setting cannot mount a first-order biological attack. With the rapid advancements in technology, we are rapidly moving from having to worry about state-based biological programs to smaller terrorist-based biological programs. It’s possible today to synthesize virulent pathogens from scratch, or to engineer and manufacture prions that, introduced undetectably over time into a nation’s food supply, would after a long delay afflict millions with a terrible and often fatal disease. It’s a new world. Though not as initially dramatic as a nuclear blast, biological warfare is potentially far more destructive than the kind of nuclear attack feasible at the operational level of the terrorist. And biological war is itself distressingly easy to wage. 1) All commercial DNA synthesis houses have screening procedures. While most DNA synthesis companies screen orders for dangerous sequences, a few do not. This gives both the synthetic biologist community members and outsiders access to feedstocks for both wild-type and genetically-engineered bioweapons. 2) The government should create and endorse new watch-lists to improve industry screening. Watch-lists are used to check DNA synthesis orders for possible bioweapon sequences and are currently not standardized by any single agency, corporate or governmental. Current lists focus almost exclusively on select agents and toxins. Many other potentially dangerous sequences are not included. Current organism-level lists generate a large number of false positives which must be examined by hand. This makes screening impractical for oligo houses that fill up to one thousand orders per day. The number of false positives will also become a problem for DNA synthesis companies as their businesses grow. Better software and more specific sequence lists can potentially fix these defects. Such tools would (a) make existing DNA synthesis screening more accurate and sustainable, and (b) allow oligo companies to start their own screening programs. 3) The government should create a confidential hotline for biosafety and biosecurity issues. All experimenters contemplating “experiments of concern” should obtain independent expert advice before proceeding. The hotline should make such advice freely available to all experimenters, including non-members (e.g. hackers) who cannot otherwise obtain such advice from formal university, company, or NIH safety committees. This would either be a parallel mechanism to the system on the ground of Institutional Review Boards (IRBs) that handle this work in academia or the current mechanism should be expanded to handle all experimenters. The hotline should also encourage researches to investigate and, if necessary, report dangerous behavior. The encouragement should be in the form of rewards for finding any dangerous behavior. More generally, we think that the idea of codes of conduct for biosecurity is somewhat misleading. Codes of conduct probably make sense for biosafety, because in that case each biologist needs to be continuously thinking about whether his or her experiment is being done safely. Biosecurity is different. The main thing we want to avoid here is somebody doing an “experiment of concern” that makes weapons radically easier or more effective. This is a one-time decision and most of the knowledge needed to make that judgment does not really involve biology. People have been building bioweapons for fifty years and if you aren’t part of that community it’s very easy to guess wrong about whether your experiment is harmless. Some time ago, NIH funded a grant to improve our knowledge of how toxic botox really is. Sounds fine. But the experimental method involved figuring out how to stabilize ultrapure botox, which is something that the US and USSR both failed to do in the sixties. Biologists can’t reliably know this kind of history or what’s important, it’s not their subject and its not reasonable for every biologist to learn it. Get a sanity check. If you think that you have an experiment of concern, then get qualified outside advice. Lifeboat Foundation Scientific Advisory Board member Stephen M. Maurer is working with people at Maryland, Duke, and Northwestern to set up a portal where people can get this advice. We think a public pronouncement that you should always get a qualified outside opinion is important and would stop the practice of doing the experiment and then announcing it to the AP. Make the community more transparent. If you look at how US intelligence went about deciding whether the Nazis had a bomb project, they used the worldwide physics community to find out who had suddenly stopped teaching or dropped out of sight. So if we can make science communities more transparent, then that’s presumably going to pay dividends later on. You can imagine taking steps like holding reunions, even a community web site with names would be good. A related point is that there needs to be an understanding of when telling the cops is right and moral  we have a post-McCarthy confusion in this country. If the guy down the hall seems to be doing something strange, I would say you have an ethical obligation to find out. And, more than that, call in the University and ultimately the FBI if you can’t satisfy yourself that nothing bad is going on. We think a public pronouncement that yes, whistle-blowing is commendable would immediately make terrorist projects riskier. This might not be a huge barrier all by itself, but terrorists usually get tripped up on relatively small things. And after the fact, it almost always turns out that people had some inkling what the guy down the hall is doing. So we think it would be worth doing. We call for the development of a “first level barrier” by 1) Stockpiling industrial disposable particulate respirators such as the N95, N99, or N10 types. This mask will prevent the user from being infected, or if already infected, from spreading it to other people. If a plague became serious, it would probably be best for the government to put on TV spots that tell people that your best chance of surviving a plague (natural or otherwise) is to simply stay home. Which, by the way, is also the best way to stop transmission. 2) Installation of intense UV field generators in the HVAC system of aircraft and other public places as described in our report for Virgin Atlantic. 3) Stockpiling of antiviral drugs such as Tamiflu and antibiotics such as Cipro. One technology to develop is RNAi-based viral suppression. Also, further strategies for battling viral infections are being developed by biotech and pharma companies, such as research programs focusing on the use of decoy oligonucleotides, aptamers, and other small molecules such as peptides and glycopeptides to inhibit viral fusion with human cell membranes or function. These technologies are new and largely unproven so the important and definitive times are ahead. 1) Development of rapid detection and identification technology: technologies such as these are being developed, based on electrostatic interactions with unmodified gold nanoparticles, silicon transistors (also described in DNA detection made easy), or DNA pairing with a single strand DNA tethered to an enzyme which becomes activated upon binding to the complementary strand. 2) Development of “smart” materials such as antiviral surface coatings that are being tested for use in face masks and other applications. 3) Further advances in sequencing technologies, ultimately reaching a target of full virus sequencing within hours. As mentioned, identification of the virus used for the development of a vaccine or other treatment for an unknown virus necessitates the rapid sequencing of its entire DNA or RNA genome. Sequencing technology is in widespread use and is constantly decreasing in cost per segment sequenced as well as in the time taken for the sequencing. The relevant outcomes of development in this field will reduce sample preparation time as well as expand the diversity of materials useful for isolation of viruses to be sequenced (blood, saliva, skin, mucosa). As faster sequencing times and better sequence assembly software are constantly being developed the need for these measures to be specifically undertaken is of lesser importance. Examples for emerging rapid sequencing technologies include nanopore-based sequencing, sequencing based on nano-scale electronic and photonic effects, and sequencing performed using microarray-based fluorescently-tagged polymerase and nucleotides. 4) Software-based treatment design. A longer term and expensive (though ultimately valuable) avenue of research, which would be useful in a variety of medicinal applications, would be the development of a comprehensive software system able to analyze the genetic makeup of a virus as well as the proteins it expresses (its proteome), which could provide specific epitopic or conformational targets to interfere with the production, processing and function of these molecules. The initial identification of viruses susceptibilities would help determine the most likely effective antiviral treatments based on DNA, RNA, or protein-based interference strategies. Software-based strategies should also allow the identification of the optimal protein sequences to be used as a vaccine, and be able to accelerate the “good guys” response in the “arms race” as further bioengineered, malicious pathogens are developed. 5) We need to develop a universal flu vaccine which would protect against all or most strains of influenza. We support Bill Gates’ $12 million Universal Influenza Vaccine Development Grand Challenge in partnership with the family of Google Inc. co-founder Larry Page to accelerate the development of a universal flu vaccine. 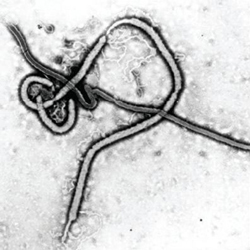 Infectious human viruses are almost always either airborne or spread by direct person to person contact. The first mode of propagation of deadly rapidly infective agents would be potentially suicidal in the global sense for a terrorist group or nation. Such infections know no boundaries imposed by nations or ideologies. (It would be possible for a nation or terrorist group with sufficient resources to produce a vaccine that would protect them against such a release… A scary scenario was played out in fiction a few years ago in Rainbow Six by Tom Clancy.) The second mode would be far too slow in any event and good public health counter-measures already exist for slowly propagating infectious agents. Because it would be suicidal for a terrorist group or nation to use airborne infectious viruses, they may decide to use engineered bacteria or prions instead. (Although suicidal terrorists do exist!) To combat these threats, we propose frequent testing of the water supply, not just for known bacteria but for the biologically necessary consensus DNA sequences that would be present even in engineered organisms. All known toxin-producing sequences should be tested for as well. We also propose more extensive testing of the meat supply for prion sequences and we are definitely against the current government regulations which prohibit meat processors from doing extra prion tests at their own expense! This testing would be expensive but we are currently doing way too little of it. Additionally, testing air in cities would be useful. Note that technologies like PCR get cheaper every day and large scale testing of this kind would further reduce the per test cost. We support development of the prion blood test being developed by Claudio A. Soto’s group. This new test is a million times more sensitive than conventional antibody-based techniques for detecting prions. It would be more cost effective if those funding the BioShield set specific goals and gave prize money to the people/organizations that accomplished them than simply funding research without such goals. We propose that we take the measure of this threat and make preparations today to engage it with the force and knowledge adequate to throw it back wherever and however it may strike. It is time to accelerate the development of antiviral and antibacterial technology for the human population. The way to combat this serious and ever-growing threat is to develop broad tools to destroy viruses and bacteria. We have tools such as those based on RNA interference that can block gene expression. We can now sequence the genes of a new virus in a matter of days, so our goal is within reach! We call for the creation of new technologies and the enhancement of existing technologies to increase our abilities to detect, identify, and model any emerging or newly identified infective agent, present or future, natural or otherwise  we need to accelerate the expansion of our capacity to engineer vaccines for immunization, and explore the feasibility of other medicinals to cure or circumvent infections, and to manufacture, distribute, and administer what we need in a timely and effective manner that protects us all from the threat of bioengineered malevolent viruses and microbial organisms. Time is running out. These goals have been endorsed by Bill Joy and Ray Kurzweil in the New York Times op-ed Recipe for Destruction and by U.S. Senator Bill Frist. Contribute to our A-PRIZE to put the development of potentially dangerous artificial life forms in the open where it should be. Influenza Surveillance and Contingency Plans. Lists them by city, country, county, hospital, and international body. New York University’s PLAN C (Planning with Large Agent-Networks against Catastrophes): Planning responses to Catastrophes using a novel agent-based model simulation computational tool. PLAN C was designed and developed by the NYU Bioinformatics Group under the supervision of Bud Mishra and with the interdisciplinary collaboration of a team of experts from the NYU Centre for Catastrophe Preparedness and Response (CCPR). Cellular Visions: The Inner Life of a Cell, an eight-minute animation created in NewTek LightWave 3D and Adobe After Effects for Harvard biology students. The animation shows a number of molecular machines  ribosomes, motors, and more  working to move molecules and structures around a cell, and even to create the structures. It also shows a lot of membrane events, and molecules working with and through membranes, and a few organelles. It shows the molecules in their real molecular structure  these are renderings of experimental data, not artists’ conceptions.